With the holiday season approaching, one cannot go wrong with giving the gift of travel. If your wallet isn’t big enough to splurge on flights to an exotic destination or an ultra-luxury accommodation, you can still get a solid travel gift for someone special that is top-of-the-line and not break the bank. That’s where the Main Line Duffel from Paravel comes in. The lightest piece of luggage the company has ever released, this bag is ideal for long trips or weekend getaways comes in six stylish patterns for all types of fashionable travelers. The Main Line Duffel is far from your standard duffel bag. We’ve listed five reasons travelers with a sense for style will love it, making it an ideal gift for the upcoming holiday season. Standard duffel bags (and most travel bags, for that matter) are made from materials that turn into a mess when wet. That turns to a problem of the past with the Paravel quality built into it. Water-proof, stain-proof and overall durability makes it the top choice for travel to locations with any types of weather. We certainly enjoyed having it on-hand as we traveled through a rainstorm! Travelers love saving money on flights, and a great way to do so is cutting-out bag fees. 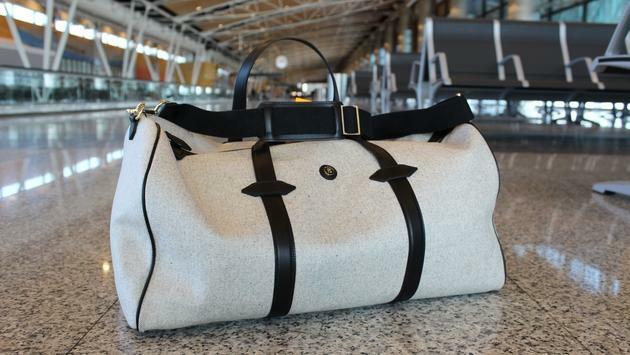 This duffel bag fits snuggly under the seat in front of you on most planes, so you can count it as a personal item or a carry-on and not pay extra. If you’ve ever hotel hopped on a trip, you know the struggle of unpacking and packing back up a couple days later. Whether you’re a heavy procrastinator or beyond busy, this bag makes it as hassle-free as possible. Loads of room inside, a best-in-class zipper and a thick shoulder strap means load up and go without worries of the bag staying together or dragging you down. Paravel is a brand known for their good taste in design, and the available prints for the Main Lain Duffel are timeless. There are six to choose from, which includes some that have a more classic look (Domino) and others for more exuberant travelers (Bebop). The bag is just the right size. Not too big to lug around, and not too small where you don’t fit anything inside. In fact, your eyes may deceive you – because there is much more room inside than it seems. With that factor, you won’t have any problem storing souvenirs inside for your trip home. The Main Line Duffel also features an Italian leather trim, removable shoulder strap, and interior zip pockets. To make it more enticing, Paravel is currently offering free standard shipping for this bag on their website. Cross off a name (or a few) from your holiday shopping list by ordering the Main Line Duffel today.